Santorini has a surface of 75,8 km2 and the longest drive from Oia to Akrotiri is about 25 km. 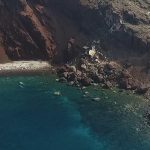 Most visitors rent a car or bike in order to be able to move from village to beach on will and to explore every corner (the hidden gems like secluded beaches and seaside taverns) as the bus service connects only the main villages with Fira. In this section you can compare between several Santorini car hire companies. 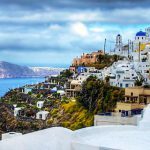 In order to rent a car with most firms in Santorini you need an international or national driver's license, held by the driver for at least 1 year. The minimum driver's age is 23 years for cars and depending on the model and the car rental company it could be 25. About drinking and driving: Be aware that police blocks are regular especially in the summer season and on Saturday nights. Drive safe! 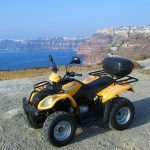 Vacation-in-Greece.gr presents here a directory for Santorini car rentals and scooter and motocycle rentals. All booking requests are directly received by the car & motorbike rental agencies presented below and all offers are updated by the managers of the agencies in real time.